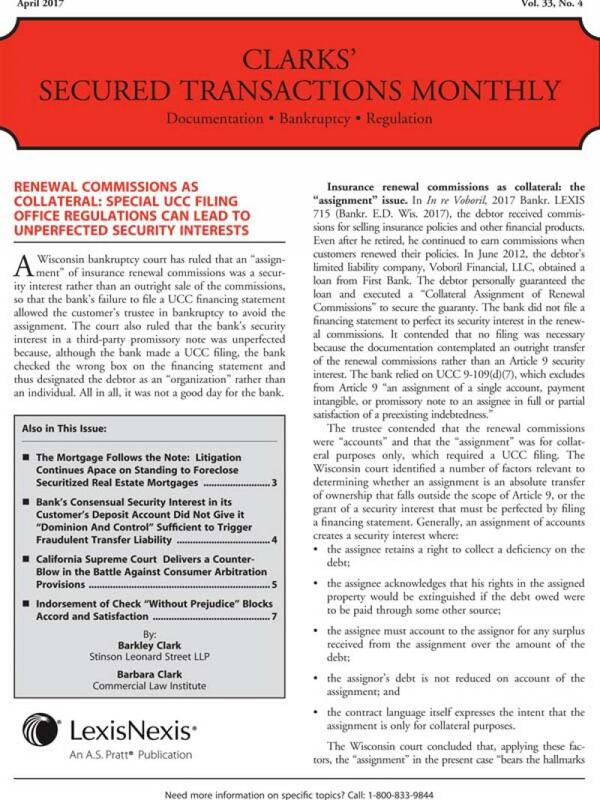 Expert authors Barkley Clark and Barbara Clark cover the latest developments and court decisions on UCC Article 9. Mistakes in secured transactions are costly making it more important than ever to stay current with evolving laws and regulations by subscribing to this monthly newsletter. 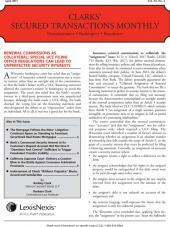 Your subscription will cover the latest developments involving the 2010 amendments to UCC Article 9, including the "debtor name" amendment, as well as discussion of court decisions that apply to the amendments. Mistakes in secured transactions are costly, and with more borrowers being thrown into default and debtors desperate to find flaws in their contracts, it is more important than ever that you stay current with evolving laws and regulations. Clarks' Secured Transactions Monthly is a convenient, fast, succinct way to get the latest information on what's going on in this area. And it's written by the absolute authorities on this complex and highly relevant topic. Changes affecting secured lending happen so quickly in the courts that you can't afford to wait for book updates; the Clarks track and analyze what is happening right now. With Clarks' Secured Transactions Monthly, you can sit back and let our experts bring the best analysis available right to you -- with no effort on your part. Free material on the internet is free for a reason. Valuable strategies and analysis from the Clarks are worth the subscription--order yours today! BARKLEY CLARK is well known as a national authority on commercial and financial services law, particularly secured transactions under the UCC. He is a partner in the law firm of Stinson Leonard Street LLP, located in the Washington, D.C. office. He advises financial institutions and businesses around the country on a variety of UCC and federal banking law issues. He has also practiced oil and gas law in Denver, and represented a major refiner in the recent SemCrude litigation. For many years, he has been listed in Best Lawyers in America. He is a graduate of Amherst College and Harvard Law School. During a teaching career spanning 45 years, he has taught commercial and banking law, including secured transactions, at the University of Kansas School of Law, Georgetown Law Center, George Washington University, and the University of Virginia. His publications are relied on by practicing attorneys and bankers throughout the financial services industry and are frequently cited by federal and state courts. Mr. Clark has served as a special advisor to the Federal Reserve Board, the Uniform Law Commission, and state legislatures around the country. In the 1990s, he served on the original Study Committee for the Revision of Article 9 of the UCC, which changed a number of the rules governing oil and gas finance. He has also served on the board of directors of a national bank. 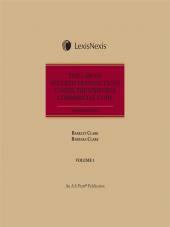 With Barbara Clark, he has co-authored two major treatises in the banking law area, The Law of Secured Transactions under the UCC and The Law of Bank Deposits, Collections and Credit Cards. With Barbara Clark, he also publishes a monthly newsletter, Secured Transactions Monthly, which reports on timely topics in secured lending, including oil and gas topics. BARBARA CLARK is a former federal prosecutor and commercial litigator with over 35 years' experience. She is a partner in the Commercial Law Institute, Greenwood, Virginia. Ms. Clark is a graduate of Hamilton College and the University of Maryland School of Law. She has been a partner in private practice, specializing in commercial litigation and has represented financial institutions before federal and state regulators. One of Ms. Clark's areas of special interest is financial fraud and risk management. With Barkley Clark, she is a co-author of The Law of Secured Transactions under the Uniform Commercial Code and The Law of Bank Deposits, Collections and Credit Cards. With Barkley Clark and Mark Hargrave, she is co-author of Compliance Guide to Payment Systems: Law and Regulation. 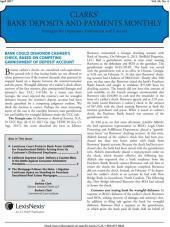 She also co-authors two monthly newsletters - one on secured transactions and the other on bank deposits and payments.